And the Lord will set his hand again the second time to restore his people from their lost and fallen state. Wherefore, he will proceed to do a marvelous work and a wonder among the children of men. If you haven't yet done so, it’s important you read the other 5 parts of this series before reading this installment, as they lay vital groundwork for what I will present here. Note: It’s rather preposterous that I’m taking on today's subject in a single blog post. There should be books, no—libraries, written about God's marvelous work in our day as prophecies that have stood for millennia are fulfilled. So please remember, I’m only giving an overview, and introducing some concepts. A fuller understanding will require study and prayer. That’s up to you. If it happens again; if the Lord does indeed call and empower another "voice crying in the wilderness" in our day, will you recognize him? How? Well, it has happened. Today I'm going to tell you about it. Let’s start with a very important question: Why is there a need for a return to the prophetic pattern in our day? The answer will require us to look at our history; if we want to understand where we are, it’s important to first understand how we got here. The Latter-day Restoration of the Gospel started in 1820 with Joseph Smith’s first vision. This signaled the end of the long night of apostasy as the Lord sent new revelation into the world and sent a true messenger to teach a true message. Faithful to the prophetic pattern, the one God called was a religious outsider, without title, credentials or worldly authority, yet he spoke for the Lord, having received the message by direct contact with Christ and angels. New records came forth and gospel truths long lost were again taught on earth. The flood of heavenly light between 1820 and 1836 was remarkable and miraculous. There is much contained in that statement. "They" are religious and pious. "They" zealously teach the gospel, but fail to actually believe it in their hearts or live it. "They" have a form of godliness, or a godly appearance, but "they" do not have the power of godliness, and therefore cannot behold the face of God and live (D&C 84:22). Hence, a prophet named Joseph Smith was sent to restore missing truths and receive missing power. He beheld the face of God and told the world. From the very beginning of the restoration, Joseph sought to establish the prophesied latter-day Zion. (D&C 21:7-8) In fact, he tried three times to do it. The first try was at Kirtland. It failed, and Joseph had to flee for his life. The second try was at Missouri, and it culminated in Joseph being imprisoned in Liberty Jail and the saints being violently driven from the state. This time the sentence of death was passed on Joseph’s head, and he was only saved because his executioner refused to obey the order to execute him. Therefore, according to scripture, the saints were commanded to build the temple, and given a finite amount of time to get it done. If they didn't labor with all their might and complete it in time, they would be rejected as a church. The Lord states in plainness that he had, by 1841, taken the fulness of the priesthood away from the LDS church. But he offered to personally come and restore the fulness if the people would offer the required sacrifice in the form of a temple. Dedicated space was required for the the Lord to come and do what was needed. It couldn't happen in any other way, for "there is not a place found on earth." And it shall come to pass that if you build a house unto my name, and do not do the things that I say, I will not perform the oath which I make unto you, neither fulfil the promises which ye expect at my hands, saith the Lord. For instead of blessings, ye, by your own works, bring cursings, wrath, indignation, and judgments upon your own heads, by your follies, and by all your abominations, which you practice before me, saith the Lord. This is the way the Lord ordained for the saints to prove themselves faithful; this was the acceptable sacrifice that would overcome past failures: Prove yourselves faithful. Build the temple. Labor with ALL your might and get it done in the allotted time. After two disappointing failures, I don’t believe the Lord was messing around. Unless he is a liar, He actually expected the saints to learn from their history and do as He commanded this time. Well, long story short, the saints didn’t get it done. The outside walls were only up to the second story when Joseph’s life was sacrificed. Other structures were beautiful and complete, including the Masonic hall, numerous brick homes, businesses, shops, mercantile establishments, the Seventies hall, newspaper office, etc. The people didn’t labor with “all their might” to make the appropriate sacrifice to God, and instead spent their labor on other projects—building a beautiful city around a half-finished temple. 1. Joseph’s life was forfeit. 3. Christ never came to the temple to personally restore the fulness that was lost. 4. The spot was not consecrated or defended by the Lord. 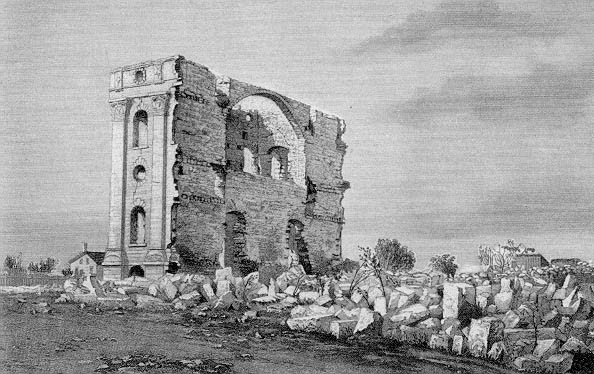 In fact, the temple was quickly desecrated, burned, and knocked down by a tornado. 5. The people were indeed “moved out of their place” and forced to leave Nauvoo. 6. Incredible suffering, deprivation and hardship followed the saints for many years as they crossed the plains and re-established in the West. A lesser portion has continued with the LDS church since the death of Joseph. Even in our temple work, we only have a lesser portion. For example, our washings and anointings today inform us they are not the real thing, but only preparatory to the real thing. 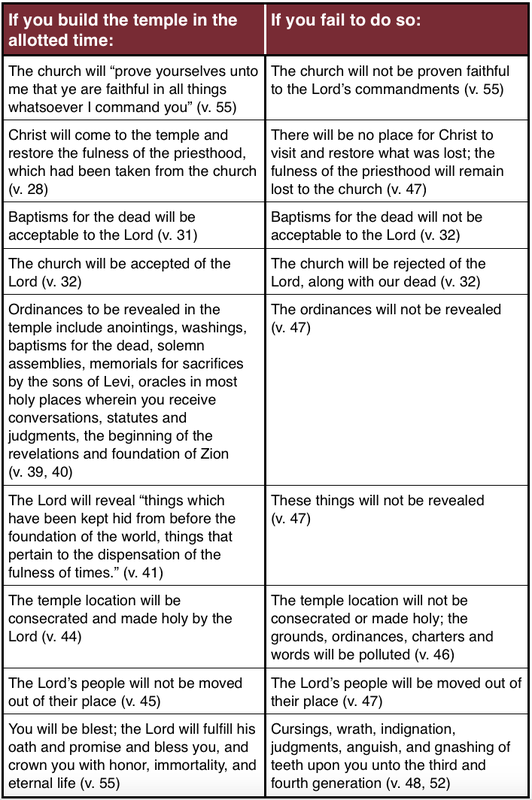 D&C 132 informs us ALL our ordinances are conditional in nature. It’s all preparatory and not binding until, and unless, it is independently sealed by the Holy Spirit of Promise. Those who have the fulness do these things. They don’t have to do all of them, but if they do ANY of them, it is evidence of the fulness. Who does them today? Those who claim to have the keys and fulness do no such works. This is very different than what we pass from one man to another, by the vote, will and action of men, in the church today. So to summarize: the Lord, in plain English, said he took away the fulness of the priesthood. (124:28.) There is no record of him ever bringing it back. Joseph, who held the keys, was killed, largely due to the actions of current and former church members. 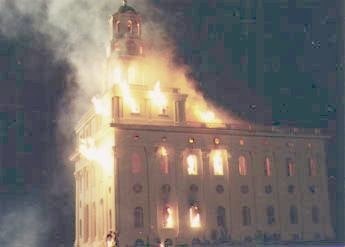 The church was driven from Nauvoo, suffered incredible hardship, and fundamentally changed in many ways. The Lord’s pronouncement that the fallout of failure would last until the third and fourth generation is an interesting timetable. The Lord, for good reasons, requires a certain amount of time to pass before another opportunity is granted. This is, in part, to ensure that not only those who failed to obey will pass from the scene, but also all those who knew them or were directly influenced by them will also be out of the picture and unable to pollute the next attempt. Another opportunity requires a fresh start. During the intervening years between 1844 and today, much has changed in the movement Joseph founded—including altering, ignoring, suppressing, and neglecting what Joseph Smith taught, and attributing entirely new words to Joseph that he never taught. In summary, since the death of Joseph, light has continually diminished and truth has been lost. But the LDS church, all while calling itself Zion, has become a massive, wealthy corporation, run by financial interests, lawyers, marketing experts and middle managers, but largely without the gifts of prophecy, seership or revelation. But the Lord, ever hopeful, has persisted with the LDS church as well. Like the Israelites of old, even with the lesser portion, the LDS people have been recognized and led by the Lord as the requisite time passed before another attempt was possible. The Lord has been extremely patient, offering ample opportunity for repentance and return in the intervening years, both personally and institutionally. The first generation passed and Zion didn't come. Likewise the second and third. The fourth generation from Hyrum Smith, the patriarch, was Eldred G. Smith, emeritus Patriarch to the church. He was Hyrum's great, great grandson, and he died April 4, 2013, at age 106. When he died, interestingly, he was the oldest man in Utah. The passing of Patriarch Smith, Hyrum’s direct descendent and holder of the patriarchal authority, marked the symbolic and literal passing of the 4th generation, and the opening of a new opportunity to continue what Joseph Smith started. The opportunity is here again. And so we come to the prophetic pattern. According to our scripture, the LDS church lost the fulness of the priesthood many years ago, and the restoration of the gospel effectively ended, incomplete, in 1841. The church then endured the Lord’s wrath and a lesser light for the required four generations, while failing to realize the predicament at hand or the meaning of our history. Those in power invented a narrative that made the LDS people chosen, special, and utterly unable to be led astray—all the while claiming Joseph's titles, but utterly failing to demonstrate Joseph's gifts. The charade has been monumentally effective, convincing otherwise intelligent and thoughtful Mormons to believe what is clearly unscriptural and not true. But the charade, like all falsehood, will eventually end. According to the Lord’s prophetic pattern, prior to the coming destruction, we can expect that an authorized servant will again be sent with a message of repentance. We can expect such a man to arrive from outside the LDS hierarchy, without credentials, title, position, or earthly authority, but WITH a message from the Lord. We can expect such a messenger to boldly declare he has been in Christ’s presence and been given the words to speak. We can expect him to speak the words of eternal life. And, true to God’s pattern, and right on time, such a man has arrived. Brother Snuffer was raised a Baptist in Idaho. He knew of the LDS church but had no interest in it. Eventually he joined the Air Force and found himself in New Hampshire, where a chance encounter led him to begin meeting with the missionaries. After a lengthy investigation, he joined the LDS church and became a faithful member in 1973. He lived a typical LDS life, serving in the church, marrying in the temple, raising a family, and establishing his career. He tried to take the gospel seriously though, and studied it incessantly. His life presented him many experiences, including a heartbreaking divorce. He was, in most ways, a pretty typical Mormon, and by his own admission, not the best example. But he believed the scriptures. He believed Joseph Smith, who taught that to receive the Second Comforter meant to receive the Lord Jesus Christ, literally, in the flesh. Because he believed such a thing was possible, he sought it with diligence. And in February, 2003, he received what he sought. He met the Lord Jesus Christ in the flesh. The Lord came to him and ministered to him. He does not talk about the content of that visit, but he does testify it happened and is real, just as the scriptures say. He has met with the Lord or his messengers on multiple occasions since then. He has been taught by them. One result of receiving the Second Comforter was that Brother Snuffer was asked by the Lord to write a book so others could follow the same path into the Lord’s presence. 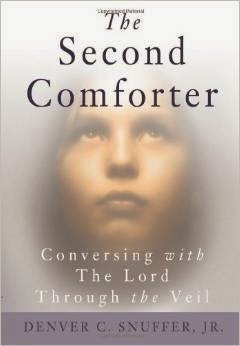 That book, published in 2006, is titled, appropriately, The Second Comforter: Conversing With the Lord Through the Veil. Others have read this book, followed the path it outlines, and received the Second Comforter. I first read this book in 2011, and it changed my life in permanent and significant ways. Brother Snuffer kept writing books on gospel topics, publishing six additional books (for a total of seven) through May, 2011. Most of his books focused on expounding scripture. They are powerful and profound, and were written from a faithful LDS perspective, such that they didn't cause much controversy. But that changed with his 8th book. 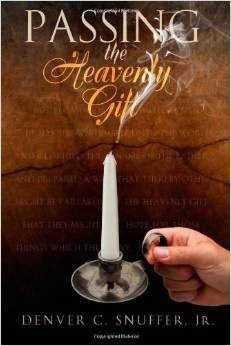 Titled Passing the Heavenly Gift, this book took the step of looking at LDS history through the lens of scriptural prophecy. In other words, since our scriptures contain ample prophecy about our day, including specifics about followers of Mormonism, why not look at our history in light of the prophecies about us—rather than evaluating prophecy in light of the vain things we tell ourselves about our history? This approach shows our history not as an unbroken string of successes in the Lord's work, but rather as a litany of repeated failures to receive what has been offered by God—very much like the history of nearly every other dispensation of the gospel. The children of Israel are an applicable parallel to the LDS people. Brother Snuffer's approach was to start with prophecy and then examine our history to see how it fit, rather than the usual approach of starting with self-congratulatory assumptions and then explaining how we are chosen and special, and the prophecies all apply to others. Needless to say, his approach caused quite a stir, leading to the ultimatum from the highest levels of the church that Brother Snuffer remove the book from publication or face excommunication. At about this same time, Brother Snuffer announced he was starting a lecture series, speaking on the topic of Zion over the course of 10 lectures inside a year. Though this lecture series was conducted completely outside any LDS property, delivered at no charge to the public, and paid for at Brother Snuffer's own expense, the LDS church nevertheless included in its ultimatum that Brother Snuffer must cancel this lecture series or face excommunication. During the course of interactions with church leaders, the book Passing the Heavenly Gift was read by members of Brother Snuffer’s local leadership, the Seventy and the Quorum of the Twelve, who all rejected it. One of the Twelve insisted that Brother Snuffer’s Stake President take action and excommunicate him. And so he was cast out of the church in September, 2013, having been a member of the LDS church for 40 years. The decision was announced the day of his first lecture. He delivered his lecture series, speaking in 10 different cities. I personally attended nine of those lectures and found them deeply insightful, filled with light and truth. The purpose of all the lectures was to remind us of, and help us appreciate, what the Lord gave the world through Joseph Smith. We can't expect the Lord to give more until we take seriously what has already been given. Brother Snuffer stated explicitly in his lectures that the content of what he shared and the scriptures he discussed were delivered personally to him by Jesus Christ. I therefore conclude that this makes them prophecy. False or true, there is indeed fruit to examine. At this point, if you're not already familiar with this narrative, you likely have a lot of questions. I'm going to try to address them, but first I want to give my interpretation of the events I've outlined above. In so doing, I want to reiterate, what I express here is my own thinking. I do not speak for Brother Snuffer, and frankly, he's likely not comfortable that I'm talking about him at all. But the events unfolding right now, before our very eyes, are too important not to mention. I keenly feel my inadequacy to declare this message, but I also know what the Lord has asked of me, so I'm doing the best I can and counting on the Lord's help. Denver's message has changed my life. Since I began reading his books, blog and lectures, I have been filled with light and truth, quickened by the Holy Ghost, and drawn much closer to the Lord. I've received a much greater understanding of Joseph Smith, the restoration, the scriptures and the Lord. My power to overcome sin has increased, my weaknesses have become strengths, and my character has been remodeled. I say none of this to boast—rather, I simply seek to declare the fruit born in my life. This blog has been one of the results of the light and truth I've received. I have learned to hear the voice of the Lord speaking to me, and I try to do what is asked. I believe these experiences and blessings are the direct results of Brother Snuffers' teaching me to seek the Lord for myself, and encouragement that those who seek shall find. Denver Snuffer fits the prophetic pattern in every particular. Though he will not call himself a prophet, he boldly declares that he has spoken with the Lord face to face and has been given a message to declare. Yet in so doing, he never points to himself and only points to the Lord. He invites all to seek Christ for themselves. He refuses to lead an organization, start a church, accept money, or even earn book proceeds. He declared his message and went back to his regular life, awaiting further instruction from the Lord. I believe the book, Passing the Heavenly Gift, was God's offer of repentance to the LDS church. It arrived just as the fourth generation passed and the window of opportunity opened again. Denver Snuffer published it and then kept quiet. He did not seek to lead, to displace church leaders, or to seek any title or position at all. He simply remained a faithful church member, serving the young men in his ward. The book explains our history, how we got where we are, and the dire predicament in which we now find ourselves. Had the book been accepted and heeded, repentance may have been possible for us as a church and as a people. What was lost might have been restored. Zion might have been built. But sadly, the message was rejected at every level of the church, from Brother Snuffer's local stake, through the Seventy, the Twelve and even the First Presidency. As is so often the case when the Lord calls an apostate people to repentance, the message was rejected and the messenger was cast out. The prophetic pattern held true, just as it always has. And so the Lord has turned away from the LDS church. Though His work of restoration continues, and the Lord has indeed set His hand again to gather His people, the work is being done outside the church He once claimed as His own. The rejection of His authorized messenger was a de facto rejection of Him, and will bear unfortunate consequences in the years to come. Meanwhile, some Mormons are awakening, arising, and realizing all is not well. Some are beginning to seek the Lord themselves, recognizing the prophetic warnings in our scriptures actually apply to US—the people that read them. Many who awaken and repent are cast out of the LDS church as "apostates." Those who sit in the chief seats are threatened by people who seek the Lord themselves, without need for mortal leaders or the supposed keys they hold. It is telling that those who hold "a little authority, as they suppose" will persecute those who believe in Jesus Christ, Joseph Smith and the restoration, and will do so on the basis that these "apostates" will not declare that a man who has never prophesied is, in fact, a prophet. Such leaders ignore scripture in favor of a secret administrative manual that you and I are not even allowed to read. And this is all happening with increasing regularity. The humble followers of Christ are being systematically cast out of the Church that claims it is His. Nevertheless, the awakening continues. All over the world, people are seeking and heeding the message God sent into the world by the first authorized messenger since Joseph. Fellowships are forming, spiritual gifts are manifesting, and angels are again visiting the earth. Some have met the Savior. Joseph's restoration continues. The possibility of Zion is with us again—even at this moment—among a few, courageous followers of Christ who have received His message. It is small, weak, and only sprouting, but the seed has been planted and put down roots. The Lord has set His hand again. Discerning truth from error is the universal challenge of mankind. Satan seeks to deceive, Christ seeks to rescue. False prophets and true prophets vie for your attention, and you must decide. Get it right, and you may end up redeemed and in Zion. Get it wrong, and you'll most certainly end up burned. It's up to you, but time is running out. You cannot abandon this responsibility or trust another to simply tell you what to do. You were sent here to make the choice. You must make it. I recommend you follow Christ's advice about prophets and judge them by their fruits. I've already written extensively about the utter lack of prophetic fruits among those called prophets in the LDS church. There's simply nothing by which to judge. On the other hand, here's a man who claims to have met the Lord face to face, claims to have delivered a message from Him. The message is before you, awaiting your examination. This is EXACTLY what the prophetic pattern teaches us to expect! And so you now must judge the matter for yourself. Receive the message and take it to the Lord. Brother Snuffer gave ten lectures, designed to remind us of what Joseph gave the world. Joseph's interrupted restoration cannot be renewed until we first remember what we've already received. The lectures are long, in printed form, comprising over 400 pages. The audio is close to 30 hours. Sadly, some will simply decide it's too much effort to evaluate the message, and they'll turn away. But others will show the Lord they're willing to expend some effort to seek His word. Which will you do? Here's the link where you can download the 10 talks in audio or text form. If you're Mormon, you now find yourself in the surreal position of being an "investigator." I've told you about a man who has seen the Lord and produced a long book, purported to contain a message from God. I'm challenging you to read it and then pray and ask God if it's true. If you ask with an open heart and faith in Christ, He will manifest the truth of it to you by the power of the Holy Ghost. And if it is true, then the man who produced it is indeed a prophet, in every true sense of the word—and the prophetic pattern continues! Now you know what LDS investigators must confront when they're introduced to Joseph Smith and the Book of Mormon. The situation is the same, and the challenge is now issued to you. Everything hinges on what you decide to do. If you believe and teach Moroni's promise to others, here's your opportunity to do what you claim to believe. If you decide the correct path is to reject Denver Snuffer outright, without investigating his message, you may be assured you would have done the same to Joseph Smith, had you lived in that day, or Jesus Christ, had you lived in that day. Please don't make that mistake. I have read everything Denver Snuffer has written about the gospel, at least twice. I've prayed and asked God whether what I've read is true, and God has spoken to me by the power of the Holy Ghost that these things are, indeed, true. Christ does, indeed, vouch for and own these words. And so, you and I, we have great cause to rejoice! The restoration of the gospel, cut short by Joseph's death, and diminished ever since, has resumed in our day! God speaks again! The heavens are open! The light has returned! The long night of apostasy is drawing to a close, and the marvelous work continues! Zion can yet come, and some may be spared the day of destruction! Aside from Christ's atonement, this is the most joyful, faithful, incredible message I can deliver, and I mourn because I'm inadequate to deliver it. A note about comments on this post: Please feel free to disagree with Denver Snuffer's message. If you see error, feel free to point it out and make your case. I have no problem whatsoever with that. But because I know him to be an authorized servant and messenger, I will not publish personal attacks against him. If you want your comment published, please focus on the message, not the messenger. Also, if you need to contact me personally without submitting a comment, you can use the "Contact Me" tool on the right side of this page. Thank you. I wish to add my voice to Adrian's. On the evening of June 25th, 2012, as the sun was beginning to set I was running on the Pole Cat trails in the Boise foothills. As I came over the highest hill I could see the full expanse of the foothills. As they run North West to South East, summer sunsets are spectacular. The beauty of the interplay between light and shadow is intense. With this sight before me, I began to offer up a prayer to the Lord of gratitude for the privilege of seeing this setting. I expressed the desire to see Him and indeed believed it would happen. The Lord heard my prayer. He has begun to prepare to grant this request to me. Ten days later on July 5th, 2012, the Lord began this work with me. I met someone for the first time who recommended I read the book, The Second Comforter. Over the next two to three months, I read it. It filled me with light and truth. I then began the process to read his other books and his blog, each filling me with the same light. I could discern it. I could taste the sweetness of it. I could hear the Lord's voice in the message. In Oct of 2012, I read Passing the Heavenly Gift. It shook my sandy foundation. From the rubble of this quake, I have begun to build on a more solid foundation. I am no longer bound to defend false traditions. I am free to accept truth and build on it. I am now free to separate the light from the darkness. I am now free to recognize the falsehoods that I hold and cast them out. Oh, what a liberating feeling. The Lord is indeed setting His hand the second time. I do believe that the Lord has indeed called Denver Snuffer. He has an authorized commision and message from the Lord Jesus Christ. His message to ME, is that like Nephi, Lehi, Jacob, Enos, Alma, King Lamoni Nephi son of Helaman, The Brother of Jared, Mormon, Moroni and others, I can recieve the Second Comforter, even the Lord Jesus Christ. He will take up His abode with me and lead me to the Father. I desire it, I seek it, I crave it, I ponder on it, idols are fading in my life, yes indeed, I ask for it, I knock, I seek to have my unbelief revealed to me that I may replace it with true belief. I bow down before the Lord and worship Him with all my might, mind, strength and my whole soul. I desire to be redeemed from the fall. I know the Lord has the power to do this. Before you rashly judge Denver and his message and brush him off. I would at least ask you read Denver's account of the Lord giving him a vision of His suffering in the Garden, of the crucifixion and the ressurection. Ask yourself these questions. Could this man make this up? Was my mind not enlightened? To whom does the Lord show this? Is it not true? This account can be found in the book, "Come, Let Us Adore Him". Glory be to God for His wisdom and mercy. We must put Christ and his teaching's 1st and truly live them, if we are going to be able to identify and not fall for the many false prophets around us today, or in the past. True followers of Christ can see that when Joseph quoted Christ saying "They draw near to me with their lips but their hearts are far from me. ", Joseph was actually talking about himself. For it is easy to see that Joseph did not follow Christ or keep his commandments, nor has any LDS Church leader since him. Christ taught it was easy to spot false prophets, for though they may claim to follow Christ and give inspiring talks that convince many, they don't really keep his commandments. Thus I do not believe Denver follows Christ's teachings either, so I believe he has sadly just been deceived by the false Christ's which Christ warned us so many today would be. Interesting take. So you're saying both Joseph Smith and Denver Snuffer were not/are not true messengers, and this based on not keeping Christ's commandments. Do you care to elaborate? In the case of Denver Snuffer, do you have particular commandments in mind? I would also offer the idea that Christ broke the "commandments" in many cases and was faulted for doing so. In fact, one of the most common objections to true messengers is that they are commandment breakers. Love to hear your thoughts. Indeed Jesus seems to have gone out of his way to cross the boundaries of the Jewish law. In his interaction with Jewish society he was provocative over and over. Since he fulfilled the law of Moses those infractions ended up being stepping stones to help folks examine what turned out to be their outdated belief system. I'd agree with Anonymous that Jesus is the only gatekeeper to salvation. But does Anonymous recognize the divine pattern of sending messengers to the world? If you can find a better messenger than Joseph and Denver, Anonymous, by all means hearken to their words. Adrian; Thank you. I pray all will hear. Yes, I do not believe Joseph or Denver are true messengers. They teach many true and wonderful things, like all false prophets do, and I like the way Denver is helping bring many true and vital aspects of Church History to light, that the Church of course doesn't want talked about, but I believe Joseph and Denver also preach and practice contrary to Christ. Brigham and the leaders since him, were even worse then Joseph though. I don't know how anyone could ever think those leaders were even Christian let alone true prophets. But like attracts like I guess. No righteous man and woman back then would have followed or believe in Brigham Young, for they would have seen right through him. Christ said to compare his actual words/teachings to the preaching and practices of those who profess to be his disciples, and if they differ then we can be sure they are not true disciples of Christ. It's not hard to see, especially if one truly believes in Christ. And which one of Christ's commandments did Christ break? Some old law that someone said was from God, but wasn't? The only words we can trust as really coming from God & Christ were Christ's few words in the New Testament that his Apostles wrote down while he went preaching. We can't trust anything in the Old Testament as really coming from God unless Christ confirmed it, like when he restated most of the Ten Commandments, then we know he agreed with them. The Bible is filled with the commandments of men that so called prophets said came from God, while those very prophets weren't keeping Christ's commandments themselves. So we know they were either false or fallen prophets that were being deceived by false revelation from false Spirits or from their own mind. So if Christ broke some old man-made false law, that is not breaking 'his own law'. I don't think I will elaborate here which commandments I believe Denver is not keeping or believing, for that is something everyone must see and decide for themselves, for if someone can't see it themselves, then they probably wouldn't believe when someone else pointed it out to them anyway. We only see what we are willing to see. But it's not hard to see if one will study Christ's words, for Christ was very clear, if we are willing to admit it and live it, which hardly anyone is. By your own reasoning you blew your case down the drain. You just admitted Christ's words were written down by his apostles who listened to him preach. We all know his apostles were fallible and forgetful and I dare you to listen to any speech and then go write it down exactly as it was given word for word. You can't do it. The old testament was written the same way, by fallible men. So if you write off the old Testament, then by your own reasoning you must also write off the New Testament. Interestingly, Anonymous, but not all Christ taught and did is recorded in the Bible... and not even Paul agrees with Jesus' teachings. Christ insisted that men forgive others in order to be forgiven themselves. Paul never teaches this. John 21: 25 And there are also many other things which Jesus did, the which, if they should be written every one, I suppose that even the world itself could not contain the books that should be written. Amen. So I would think if you are judging Denver or Joseph by Jesus teachings and we don't see what it is they are doing wrong even if we are reading and studying all that is recorded in the Bible... then ... we have to wonder don't we? You raise the “Voice of Warning” but give no information or facts to back up the warning or your thesis. If you are to be consider a credible source or that we should take your words seriously, should you not share the commandments that Joseph Smith or Denver Snuffer have broken so we might be able to appraise our own behavior and understanding and not be deceived? Kathryn, there are far too many things to back up to even begin to take the time to do it in regards to Joseph Smith. Do you see any red flags? If you believe he lived polygamy and still was a prophet then that is one clue right there, for Christ totally condemned all polygamy, past & present when he taught about marriage in the New Testament. But I doubt I can convince anyone of anything, especially if they don't see red flags too, but I do hope I could encourage people to study the words of Christ closer and compare them to what Joseph or Denver preached or practiced. Christ didn't give us very many commandments while he was here, his Gospel was very simple yet he was very clear cut about things, so it shouldn't take too long to investigate them. Adrian, do you accept the Word of the Lord written by the Prophets Brigham, John and Wilford? Does Snuffer accept the Oracles written by these Prophets? Has the gift to bring again the Word of the Lord-- having been restored to four early Mormon prophets after a long famine for the word-- now again been taken from the earth? Do you consider the books that Snuffer writes as a higher spiritual gift than what Joseph had when he brought forth the D&C? I am just curious. I have read none of Snuffer's books, and I agree that there are many spiritual gifts of great value, not just the gift to write the Word of the Lord. President John Taylor wrote a very significant revelation concerning the Logan Temple in which the Lord accepted that Temple. I wonder if Snuffer would accept it as a true revelation. That is an easy answer. It is Snuffers opinion that Brigham was a wicked man and usurped Joseph's authority. John Taylor upheld Brigham all his life and succeeded him in leading the church, so this negates all of Taylor's fruits also. erichard, show evidence that Brigham, John & Wilford were prophets. Did they ever testify they had seen Jesus Christ? Did they ever heal? Those are the two most basic signs and evidences of an apostolic calling . . . a call that only the Lord Jesus Christ can extend, in person, as He called Saul of Tarsus, as He called Alma the Younger. 128 Which Twelve hold the keys to open up the authority of my kingdom upon the four corners of the earth, and after that to send my word to every creature. I'm sorry but you all are mostly basing your beliefs about Mr. Snuffer on personal testimonies. If this makes him a prophet then I can quote hundreds of thousands of much more powerful testimonies written in church history and journals and autobiographies as to the legitimacy of Brigham Young, Heber Kimball, John Taylor, Lorenzo Snow and many others in early church history as being great men of God and prophets seers and revelators. So who are we to believe, a few who's testimonies seem weak, or many who's testimonies are much more powerful? I could quote many men, women and children who had visions, holy ghost, spirit of God, dreams, powerful manifestations of angels after Joseph Smiths ministry and during Brighams, Taylors, Willfords, ministry but I need not waste time and space, it is in the history books. So again who do we believe? I already know the answer but just food for thought. Desertson, I'll admit I'm confused. Are you advocating that numbers of followers make a prophet? Or that I should base my witness on what other people think of a proposition or person? Christ gave us the standard. We are to judge by their fruits. I have studied Brother Snuffers fruits and received a witness from God that He vouches for Snuffer's words. This has nothing to do with other people. It is between me and God. If you have done the same and have not received the same witness, then go in peace. Incidentally, I have similarly studied teachings of BY, JT and WW, and found much that is false and in error, as verified by the Lord. It all boils down the this; Each a everyone of us need our own personal testimony of the truth, I agree. Also, all men and I mean ALL men are fallible including Joseph Smith, Brigham, Taylor, Abraham, Moses, Nephi, and every other prophet who ever lived on earth. I can find fault with all of them if I searched hard enough. This in no way means they were not men called of God. Why do you think they crucified Christ? Many individuals found fault in him, that is history. You or I, or Denver for that matter were not alive during Brigham's, Taylors, ect, tenure as Gods head on earth so how are we to judge and stone the prophets. "All tables or "Tablets, books" are full of vomit." You know as well as I that all fallible men write history the way they see or even heard it, that is a proven undeniable fact. In fact some historians twist history around so bad as in the case of Lincoln being a hero when in fact he was the one of the worst presidents in our history. Now...just because you think, or some historian thinks or Denver thinks that Brigham erred in doctrine enough to condemn him to hell does NOT make it so. I have also read Denvers work and there is not much there that Brigham didn't already say, and I much prefer The Teachings of B Y over Denver's work as it is plain to the understanding of the hearts of men like Nephi's teaching. Christ also said he will judge by what's in our hearts. Speaking of fruits, what are his fruits? Some but not all include humbly bringing thousands of souls to the gospel of Christ. Leading many thousand more through unimaginable hardships to establish S L C. Withstanding an attack by the US gov. Hundreds of sermons full of truths. I could go on with volumes of his good fruits. So just because Denver finds fault with him does not mean it is true. I wonder where we would all be if Brigham hadn't established the saints in the rocky mountains? To answer your question above, I was just reading the comments where some gave their testimonies of Mr. Snuffer which is fine and great that they can, but proves nothing. Don't get me wrong, I'm not trying to rain on your parade. I'm just saying before we condemn any man of God,(even though it's not our place) we better be dang sure we're on Gods side. I find it amazing and sad you refuse to post my comments. Are you afraid of the truth? If not what's there to worry about? You wrote a long blog post making your case for Mr. Snuffer and I in my opinion wrote a rebuttal. It wasn't a vicious or mean attack on his character, it was just plain common sense and a different opinion of what is truth. No offense intended at all. We are all searching for truth. First, your appeal to the authority of having read hundreds of books and testimonies--what I take from that is that there were people in the early days of the church who knew the Lord and received angels and miracles. (Though I am not aware of BY, JT and WW receiving such.) And their experiences amount to exactly nothing in our own quest for salvation. The more important question, and one I started asking very early in this blog, is whether we are receiving the same experiences now. If so, we should declare it. If not, then we are suffering from unbelief and all is vain. Moroni 7:35-37 makes that clear. Second, there is certainly much positive about Brigham Young, and I have expressed my appreciation of him elsewhere on this blog. Yes, he accomplished many great things, as have many men in history. Great accomplishments do not make a prophet. I've written enough about prophets on this blog to make that case. But of course, you are free to accept or reject who you choose. That is the test we came here to face. Face it as you will. In any event, it's interesting that the LDS church has so thoroughly rejected Brigham Young while still claiming that their prophets cannot lead us astray. And third, it shows something about your character and agenda that within less than an hour of your last comment, you were attacking me for "refusing" to post your comments. It happens that I was away from my computer for several hours for sabbath worship. I cannot post comments without a computer. It's been my experience that those who feel they have to goad or shame me into posting their comments, while hiding behind an alias, likely have a hidden agenda, and only want to continue an argument. You'll note there is a contact form on my blog, and you could have just as easily dropped me a quick note to see if I had gotten your comments, and to inquire whether there was a reason I was not posting them. Of course, that would require you to actually communicate with me in a non-anonymous fashion, which few are willing to do. The fact that you went straight to accusations, I believe, shows your true intent is only to argue. I want no part of that. Adrian, thank you for clearing that up. I apologize if I came across as attacking you for that was not my intention. I have no hidden agenda and do not wish to argue, only to inform, or defend those whom I hold in high regard as in Brigham's case. By reading some of your other posts, I see you defend those you hold in high regard also. I admit I agree wholeheartedly to a great extent of what you and Snuffer advocate, but I must take issue with what he has to say about some things. I am far from anonymous. My name is Lafe Langford. You can go to my blog you can google me and read my book (although it is not about promoting religion) There so much more I could say here but I guess if you feel I just want to argue then I will say good day and my God bless your efforts to seek his face. Pleasure to meet you, Lafe. Thank you for reading here and commenting. Are you a polygamist? Adrian wrote, "Since I began reading his books, blog and lectures, I have been filled with light and truth, quickened by the Holy Ghost, and drawn much closer to the Lord. I've received a much greater understanding of Joseph Smith, the restoration, the scriptures and the Lord. My power to overcome sin has increased, my weaknesses have become strengths, and my character has been remodeled." I too testify of similar changes in my life after receiving the message shared by Bro. Snuffer in his lecture. It is of God. Adrian, you have worked so hard at putting this series together. Thank you for this. I guess I can tell the world that, in the midst of a battle for my marriage - a battle against Denver and others - I retreated long enough to ask the Lord if Denver was a "true messenger". The answer came instantly, strongly, and clearly - "Yes". Like you, I had read "The Second Comforter" in the Summer of 2011. PTHG also rocked my sandy foundation, and I fought hard against it. Now, though, the more I learn, the more I experience, the more I am driven, first to the margins and soon completely from the church, the more it all rings true. We are very much like the Israelites, standing at the foot of Sinai, telling our Moses to go speak to the Lord for us. The difference in our case is that those of us who DO want to speak to the Lord ourselves, are cast aside by our Moses. The Lord speaks. He speaks to me. He speaks to my wife. He speaks to our children. Are we worthy of such blessings? I don't know how, but obviously He thinks so. How can we not listen to His voice? Are we deceived? That is the standard answer. We know differently. I want to add my witness to what Adrian has written as well. I was extremely skeptical of this message when it was first presented to me. In fact both I and my wife first read the beginnings of Adrian's blog and then the lectures that Denver gave with the purpose of disproving them. The thing is, we couldn't. It is truth, I have received my own witness that it came from God. I am seeing the fruits from choosing to follow Christ completely and they are so good. Thank you for sharing this wonderful message with me and my family. My heart hurts and I feel anguish as I read further and further through this blog series and Denver Snuffer's books. It's an odd place to be. Everything I've always known (thought? believed?) to be true is shifting beneath me. It's a scary. I wish with all my heart I could continue to learn truth and stay in my comfortable world. I love the people in my world. I'm sure all of you did as well. It hurts to watch how my "brothers and sisters" in the church are treating the "apostate" brothers and sisters I love so much. Apostate. This is a new term to me. I've watched people excommunicated for sin, but seeing members excommunicated because of the love for their Savior is just plane scary to me. The people and the leaders of my church are disappointing me. It's hard to watch and listen to the accusations being made to the "apostate" people I love. The truth for me is this: I'm afraid to experience the same ridicule I'm witnessing. I admire your strength and conviction. What will I do today? Continue to learn truth, and hope more truth will bring courage and clarity. Take courage! The truth will set you free! I love Alma 32. It takes the fear out of learning new truths and testing them out. We're encouraged to "plant the seed" and see if it grows. If it enlightens our mind and enlarges our soul, it is good! Every good things comes from God. Fear does not. Trust in God! So lets get on with the needy greedy. If President Monson is not 'The Prophet' of God and Snuffer says he's 'not' a prophet (although, some people say he's 'a messenger'), then who is 'The Prophet of God'? Thank you for your question. I think a couple of clarifications are in order. First, there is the implicit assumption that there is one man on earth known as "the prophet." But in our scriptural history, there are instances of many prophets all working among the same people at the same time. Our LDS background tells us we ought to seek and idolize one man. This is not so. Second, Monson does not claim to be a prophet, but he is sustained to those titles and called that by everyone in the church. Similarly, Snuffer does not claim the title for himself, but many others view his fruits and conclude he meets the definition of prophet and passes the prophetic test Jesus outlined. Okay, so let me clarify my question. Who is 'The Prophet, Seer and Revelator' on earth today? Do we have one Adrian? Yes. I believe Denver Snuffer has demonstrated all those gifts. (There are undoubtedly others on earth with those gifts as well.) I believe Denver is an authorized messenger with a message from Christ. I find it interesting that you said that because in his book, 'The Second Comforter' - he made it clear that if we speak evil of God's chosen messengers (keep in mind he wrote the book when he was a member of the LDS Church) or 'criticize' them in any way, we are breaking our Temple Covenants. That they were chosen and not us. Therefore, we cannot receive the Second Comforter if we do not keep our covenants (which I agree) . He also mentioned a few other things that pretty much contradicts what he is doing now. Especially his other book 'Passing the Heavenly Gift'. Care to explain how that works? Since you haven't referred to any specific quotes from either book, I'll just say in general that at the time those books were written, what he wrote was true. I believe things changed very significantly for the church when the leaders opted to cast out a messenger sent from God. Also, this idea of "evil speaking" has never been defined by the Lord, but speaking the truth can never be evil. Denver addresses this idea several times on his blog. I suggest you read the lectures I linked for a better understanding of what has happened. I was listening to it. I was stopped to do so. Here's another question I have. Last one, Promise :) You just said that Snuffer has all the quality gifts as a PSR. Care to share what makes him a Seer and Revelator? A seer sees visions. He has publicly spoken of and shared at least two of his visions from the Lord. A revelator reveals new or forgotten truth from the Lord. Snuffer has done much to qualify in this area, starting with his first book in which he reveals that he has met the resurrected Lord Jesus Christ, and he reveals the path that leads to such a meeting. One of his most stunning revelations is contained in his book, Come Let Us Adore Him. In it, he shares his vision of Christ's suffering in Gethsemane, and reveals MUCH new truth about how this took place. And you as well. Thanks for reading. I'd just like to add a comment on the element of evil speaking = being critical. I don't recall that being written in TSC, but if you have a citation to point to, I'm be happy to reconsider. I thought the case was pretty clearly made that we ought to be not mean-spirited (evil) critical, but critiquing or assessing what is being taught, regardless of the voice, is an essential skill in our progression. But perhaps maybe this is something that was simply expressed on the blog. Just thought I'd offer another voice on the subject. Thanks! I realize you're asking Adrian, but as for myself, since I've stopped limiting the possibilities, I've heard prophetic messages in the words of many. Anyone with "the testimony of Jesus" (Rev. 19:10) can be a prophet, right? We just have to figure out what that really means. I would point out that the scripture says THE testimony of Jesus, not A testimony of Jesus. Very different things, and a vital distinction. LDS Truth Matters...I appreciate your sincere questions. I feel to add my voice, as feeble as it is. Notice that Joseph says that "the testimony of Jesus" is to be "sealed by the Holy Spirit of Promise", which is also the "more sure word of Prophecy" which is to "obtain a promise from God" for ourselves the we "shall have Eternal Life". Therefore the “testimony of Jesus” cannot be the same as the witness of the Holy Ghost as described in Moroni 10: 3-5, it must only be the Jesus Himself, testifying to us that we are save, thus giving us promise of Eternal Life. All true prophets have received this promise, the more sure word of prophecy, for themselves. The leaders of the church today teach that the only witness we need for our salvation is the witness of the Spirit. Both Joseph and Denver have taught that we must receive the “testimony of Jesus” and that we must receive our calling and election and the Second Comforter. Modern LDS leaders conflate the Holy Spirit of Promise with the Holy Ghost (Elder Eyring did this recently). Joseph and Denver teach that the Holy Spirit of Promise is in connection with the Second Comforter. 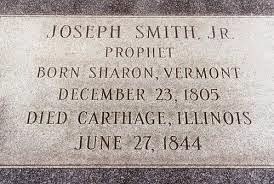 None of modern LDS prophets have declared that they have received the Second Comforter (this by the way, is different than having merely had a vision or dream of Christ, as Joseph Smith taught in the TPJS). Both Joseph and Denver has testified that they have. All of the prophets of the Book of Mormon teach the commandments of God so we can know how we can “enter the rest of the Lord”. Isaiah, Moses, Abraham and Enoch did likewise. Joseph Smith and Denver Snuffer both have done this emphatically and extensively. Today, the leaders of the Church today teach “the Lord and the Redeemer hath done his work, and he hath given his power unto men” (2 Nephi 28: 5). They teach that they hold all the keys, not only to the Church, but to our salvation as well—they can bind on earth and in heaven; they can offer blessings and revoke as they will. They in essence can deliver salvation or damnation to us through the “keys” they hold. They declare that it is not necessary to receive angels, visions, manifestations. They teach by inference that receiving our calling and election and the Second Comforter is not necessary, that all we need is to receive the Holy Ghost and enter the temples to receive the ordinances that they administer and authorize. Yet, they dole out special blessings, supercharged ordinances, secret endowments upon themselves and their friends and families that “guarantee” their exaltations, while denying these things to the rest of the faithful by their silence, selectivity, and secrecy. While God is no respecter of persons, the leaders of the Church today show their favor upon whomever they will, and administer spiritual execution at their whim. Joseph Smith was a true messenger, and it is my belief that Denver Snuffer is likewise a true prophet sent by God. Amen. I want to add my testimony here. I have known Denver Snuffer, Jr. for more than 6 years, I have read every blog post, read every book, attended almost all of his lectures and I testify that the message he bears is from God. He is a prophet, the first real prophet since Hyrum and Joseph were murdered four generations ago. Wonderful post! Thank you for giving voice to what I have learned for myself. You've spoken courageously and eloquently. We've both paid a "price" for what we've learned and testified of, but it's a small price to pay: merely removing an idol from our focus of worship so that the Lord might reign supreme! Do I "miss" the LDS Church? I miss the camaraderie, the sense of "belonging" to a community of like-minded individuals, the society of the "saints". Despite its "warts" and failings, the Mormon Church had become my culture and my community and I was "proud" to be a part of her. But my affection was misplaced. Those who have tasted and known of the goodness of Jesus and have been moved to sing the song of His redeeming love have little in common with the cultural Mormon who can hardly bear to open his mouth in worship or recite nothing more than trite, faithless phrases offered as "prayer". For all its "goodness" and "glory", "Mormonism" nowadays, so called, is but a form of godliness while denying the power thereof. And the power thereof is Christ Himself. "If you decide the correct path is to reject Denver Snuffer outright, without investigating his message, you may be assured you would have done the same to Joseph Smith, had you lived in that day, or Jesus Christ, had you lived in that day. Please don't make that mistake." Amen. These are ominous -- but truthful -- words. I too have received a witness that Denver Snuffer is God's servant and that he teaches true principles. Thank you for this wonderful post Adrian. Very clever. I see what you did there. Zing! By their fruits shall ye know them. All that you and your supposed false prophet do is try to tear down the faith of others rather than preach doctrine. You fault find in others in order to try to justify your position. Those are not fruits of the spirit my friend, not even close. You will see what you want to see. It's very rare that anyone ever loves the truth enough to let go of fear, and therefore most view these things through a filter of fear and see only attacks. Others see exactly the opposite. Having a great familiarity with what Denver has written, my opinion is that he has been extremely restrained and avoided attacks to an immense degree. He has written thousands of pages teaching truth and expounding doctrine. But, as I said, people will see what they want to see. That's the test we came here to face, and we must each face it individually.